Partly cloudy. Low 47F. Winds WNW at 10 to 20 mph.. Partly cloudy. Low 47F. Winds WNW at 10 to 20 mph. 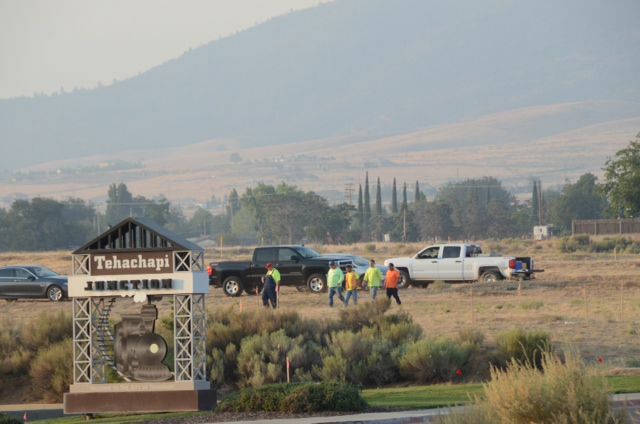 Additional equipment arrives at the Walmart site on Tehachapi Boulevard early the morning of Monday, July 30, to begin construction of the new superstore in Tehachapi. Development Services Director Jay Schlosser of the city happily holds the building plans for the new Walmart store. 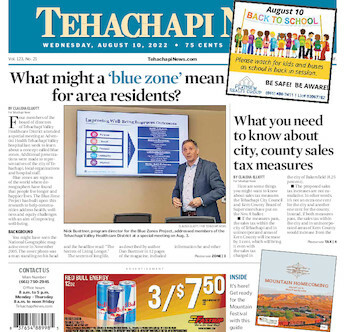 After nearly nine years, ground is broken for the new Walmart store in Tehachapi at 7:20 a.m. Monday, July 30. The soil is first loosend up with a ripper device attached to the rear of this tractor. Next step will be heavier equipment digging, leveling and preparing the building site for the foundation pour. Ripper device on rear end as it loosens up the soil at the Walmart construction site Monday morning. Superintendent Craig Stewart of Eleven Builders, Inc. signed final paperwork July 24 to start construction on the new Walmart. The ripper device on this tractor loosens soil, leading the way in construction of the new Walmart store. Development Services Director Jay Schlosser, Mayor Pro-Tem Susan Wiggins and Superintendent Craig Stwewart of Eleven Builders, Inc., left to right, hold the plans for the new Walmart store. The construction company received the green light July 24 to start moving dirt by the end of the month. Development Services Director Jay Schlosser, Mayor Pro-Tem Susan Wiggins and Superintendent Craig Stwewart of Eleven Builders, Inc., left to right, stand with the building permit for the new Walmart store to come next summer.